The Career Track is one of many communities that an ODTUG member can follow. It contains information, resources, and presentations specifically geared toward people just starting their careers. In addition to the materials and access that will make you successful, the Career Track Community will have exclusive networking events with current (and future) leaders within the Oracle Communities. Click here to go to the Community site and don’t forget to follow the #orclcareer hashtag on Twitter for the latest and greatest information and discussions. Currently work for a company that uses Oracle products in the following ODTUG Communities: ADF, Application Express, Business Intelligence, Database, and/or EPM. Be a graduate of a college or university in 2013 or later. For more information, click on this link. Kscope16 will contain sessions aimed for the new Oracle Professionals where people with basic or no knowledge about the tools will be able enjoy the presentations and leave with a very good amount of knowledge about them. For the complete list of the sessions tagged as “New Oracle Professional Tracks”, click here. DEVEPM is going to present one of them (Take a Peek at Dell’s Smart EPM Global Environment) so be sure to be there, it will be a great presentation! As we can see, ODTUG is really committed to give opportunities to everyone, from the new Oracle professionals that just graduated from college, to the senior folks that lives and breathes Oracle technology every day in their jobs. The senior people already knows how beneficial this kind of conferences are for their career, but if the young ones are still not sure if it is worth the investment or not, please read what Sarah posted about this unique opportunity and how this kind of conference changed DEVEPM lives in a way that we never imagined. Thanks all, I hope to see you all at Kscope16!!! Hi Guys how are you? In a fast-moving business environment, finance leaders are successfully leveraging technology advancements to transform their finance organizations and generate value for the business. Oracle’s Enterprise Performance Management (EPM) applications are an integrated, modular suite that supports a broad range of strategic and financial performance management tools that help business to unlock their potential. Dell’s global financial environment contains over 10,000 users around the world and relies on a range of EPM tools such as Hyperion Planning, Essbase, Smart View, DRM, and ODI to meet its needs. This session shows the complexity of this environment, describing all relationships between those tools, the techniques used to maintain such a large environment in sync, and meeting the most varied needs from the different business and laws around the world to create a complete and powerful business decision engine that takes Dell to the next level. ODI is an incredible and flexible development tool that goes beyond simple data integration. But most of its development power comes from outside-the-box ideas. Did you ever want to dynamically run any number of “OS” commands using a single ODI component? Did you ever want to have only one data store and loop different sources without the need of different ODI contexts? Did you ever want to have only one interface and loop any number of ODI objects with a lot of control? Did you ever need to have a “third command tab” in your procedures or KMs to improve ODI powers? Do you still use an old version of ODI and miss a way to know the values of the variables in a scenario execution? Did you know ODI has four “substitution tags”? And do you know how useful they are? Do you use “dynamic variables” and know how powerful they can be? Do you know how to have control over you ODI priority jobs automatically (stop, start, and restart scenarios)? If you want to know the answer to all this questions, please join us in this session to learn the special secrets of ODI that will take your development skills to the next level. Join us in KSCOPE 16 and book our 2 sessions in schedule. They will be very good sessions and I’m sure that you’ll learn some new stuff that will help you in your EPM Environment! Hi guys how are you? It has been a long time since last time I wrote something but it was for a good reason! We were working in our two Kscope sessions! Yes, this year we will have 2 sessions and I think they will be great! Anyway, let us get to the point! A little bit of context! I was working in a backup interface for one client and, because their cubes are very big, I was trying to improve the performance as much as I can. Part of the backup was to copy the .ind and .pag files and the data extract files as well. For an app we are talking in 30 gb of .pag and 40 gb of data extract files. Basically I need to extract/copy data from Essbase server to the disaster recovery server (DR Server). Nothing special here. The problem is, because the size of the files I wanted to Zip the files first and then send it to the DR server. 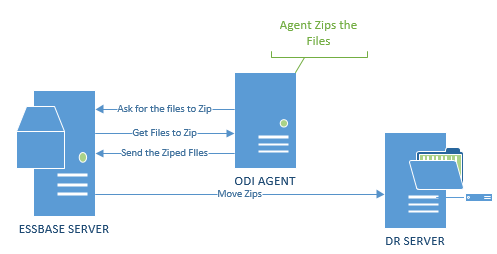 If you use the ODI tools to Zip the file, what it does is bring all the files to the ODI Agent server, zip everything and the send it back. I really do not want all this traffic in the network and all the time lost in this process (also, the agent server is a LOT less powerful then the Essbase server). Use Psexec to execute a program in the server: Same as the previous one. Ok, I figure out that in the end I’ll need to create/install something in the server… and I rate it. Well, let’s at least optimize the problem right! Then I was thinking, what I have in common in all Hyperion servers? The answer is JAVA. c: Creates a new archive file named jarfile (if f is specified) or to standard output (if f and jarfile are omitted). Add to it the files and directories specified by inputfiles. f: Specifies the file jarfile to be created (c), updated (u), extracted (x), indexed (i), or viewed (t). The -f option and filename jarfile are a pair — if present, they must both appear. Omitting f and jarfile accepts a “jar file” from standard input (for x and t) or sends the “jar file” to standard output (for c and u). M: Do not create a manifest file entry (for c and u), or delete a manifest file entry if one exists (for u). Humm, things start to looks better. Now I had to decide if I would use the Invoke command or Psexec. I started trying the Invoke command, but after sometime I figure out that I can’t execute the jar command using invoke. Then my last alternative was Psexec. The good thing about it is that is a zip file that you need just to unzip in the agent server, set it in the Environment Variables (PATH) and you are good to go. You can run anything remotely with this and it’s a centralized solution and non-invasive as well (what I liked). -w: Set the working directory of the process (relative to remote computer). -accepteula: This flag suppresses the display of the license dialog. This should not be something that complicate but it is and believe me, I create a very fast process and the client is very happy. I hope you guys enjoy it and see you soon. Hi all! Quick post today. DEVEPM recorded one more OTN 2MTT, now talking about “Speed Your IT Career”. In this 2MTT I talk about my ODTUG webinar “Where to start? ETL Developer Career” that will happen on Tuesday, April 19, 2016, 12:00 PM – 1:00 PM EDT. Take a look and sign in for the webinar right now! ORACLE SQL for EPM tips and tricks S01EP04! ORACLE SQL for EPM tips and tricks S01EP03! ORACLE SQL for EPM tips and tricks S01EP02!